Professor M.S. Swaminathan was granted with the first World Agriculture Prize on 27th October 2018. 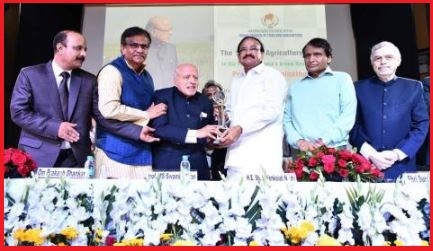 It was presented by Vice-President Venkaiah Naidu at Vigyan Bhawan at a special session, named Swaminathan Global Dialogue on Climate Change and Food Security organised by the Indian Council of Food and Agriculture. The World Agriculture Prize instituted by the Indian Council of Food and Agriculture (ICFA). The ICFA’s World Agricultural Prize carries a cash component of $1,00,000 and will recognize individuals who have served humanity through agriculture. The ICFA’s World Agricultural Prize will be an annual prize and would be presented to any individual or institution, importantly from Asian, African or Latin American countries who have played a seminal role in transforming agriculture globally and saving humanity from the curse of hunger. Prof. M.S Swaminathan (93 years old) is known as and is renowned worldwide for his basic and applied research in genetics, cytogenetics, radiation, and chemical mutagenesis, food, and biodiversity conservation. Also, the United Nations Environment Programme has accorded him as owing to his commitment towards the ever-green revolution movement in agriculture. Padma Vibhushan in 1989 and among many others.